This collection consists of records related to Presidential Decision Directive 25 (PDD-25), an executive order signed in May 1994 that defined US policy on reforming multilateral peacekeeping operations and the US relationship with the United Nations in regards to peacekeeping and in peace enforcement operations. It contains memorandums and emails between members of the National Security Council (NSC), the State Department the Defense Department and others in the White House. The collection also includes numerous drafts of the PDD and its 9 annexes, meeting agendas, as well as schedules for the inter-agency core group that drafted the document and monitored its implementation. 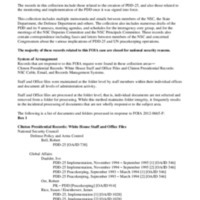 The files also contain correspondence between members of the NSC and concerned members of Congress about the various implications of PDD-25 and about general UN Peacekeeping operations.